Mothers have all kinds of jobs, from fixing ponytails to giving pony rides. Hereâs to all the mothers who gave us a leg up. Arianne Hagwood is one of those mothers. Read about Arianne, Tommy Jean and the mustangs they love in our upcoming special issue, Ag Pride, in the May 30 edition of Tri-State Livestock News. Photo by Laura Nelson. She fixes meals she can't eat, living on saltines and Sprite for three months. 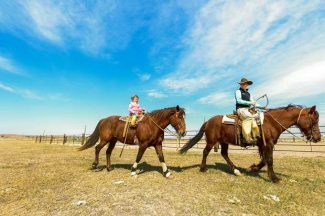 She changes the diapers that Daddy can't stomach, holds her horse back to a pony's plod. Her favorite flowers are whatever is clutched in a grubby, dimpled hand. Her lipstick is buried at the back of the drawer, behind the bag balm and Band-aids. She's the one behind the camera and in front of the stove. A hairbrush in one hand, car keys in the other, she instinctively knows which direction the bathroom is and carries a purse that will yield wet wipes, Cherrios or a crescent wrench, depending on the need. She revels in the smell of lilacs and of "compost" in the spring. She knows where to find the other boot, the baby kitties and the missing homework. She's the one standing between her kids and the rocks and the hard places, the angry cows and broken hearts. One drop of milk at a time, she keep the baby bunnies alive, and fights tears as she strokes the old mare's mane one final time. Her brother's children confide in her, and she needs the orphan calf as much as he needs her. She learned long ago that it's her heart, not her ovaries that gave her the title "Mom." It's the job she feels like a failure at, the one she'll never do well enough. When her rope is too short and frayed, she raises her voice and it breaks her own heart. It's the hardest job she's ever had and the one she'll never quit.